The Nashville Predators scored three times in the second period and rode the momentum of a raucous home crowd to a 5-1 win over the Pittsburgh Penguins in Game 3 of the Stanley Cup final. Predators coach Peter Laviolette heard all the questions and criticism of his Pekka Rinne after the goaltender's struggles in the Stanley Cup Final in Pittsburgh. Well, Laviolette never thought of switching goalies. A change of scenery helped Rinne and all his Nashville teammates as they dominated once again on their own ice for the biggest piece of franchise history yet. A victory in the Stanley Cup Final. Roman Josi and Frederick Gaudreau scored 42 seconds apart in the second period, and the Predators beat the Pittsburgh Penguins 5-1 Saturday night to pull within 2-1 in the best-of-seven series. Rinne started and made 27 saves against a Pittsburgh team that continued to struggle on the power play and lacked the same zip they had in winning the first two games at home. "There was no decision," Laviolette said of changing goalies. "He was terrific. I said that after Game 2. He's been the backbone for our team. He's been excellent. His game tonight was rock solid." 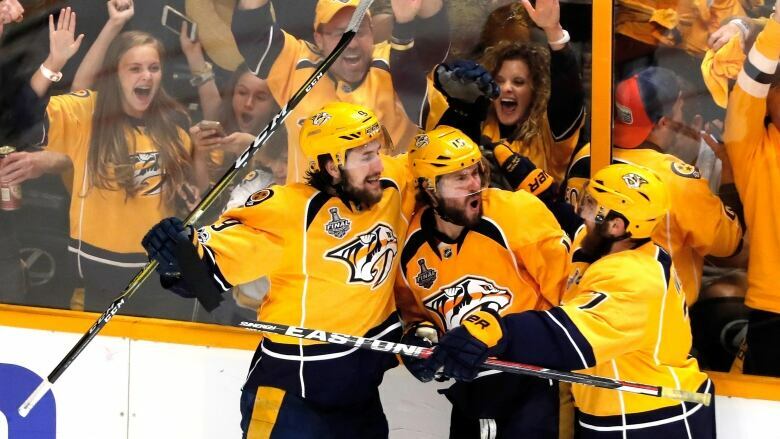 The Predators capped the biggest party in Nashville history with a victory that gave thousands of fans inside and outside of the arena reason to celebrate with even country star Keith Urban and wife, actress Nicole Kidman, high-fiving. That same crowd gave Penguins netminder Matt Murray an earful throughout the game. Josi also had two assists in the game. James Neal, Craig Smith and Mattias Ekholm rounded out the scoring for Nashville as the Predators worked out some frustration against the Pens. "Like our team has done the whole playoffs against Chicago, St. Louis, Anaheim, we showed really good composure," said Nashville defenceman P.K. Subban, who had predicted a win in Game 3. "We're going to take that into the next game." "I thought we gave them a couple of freebies where we didn't force them to have to work for it and that's an area we've got to be better moving forward," Pittsburgh coach Mike Sullivan said. "We're disappointed we didn't get the result, but we also understand that this is a series. Our guys, they've been through this. They can draw on their experience. We're not going to let this certainly get us down. We're going to learn from it, move by it and get ready for the next game." Captain Sidney Crosby did not have a shot on goal, and neither did Evgeni Malkin. "Hopefully a game like this is something that's a hard lesson," Crosby said. "But we've got to make sure we're better." Jake Guentzel scored his 13th goal this post-season and fourth of this series for Pittsburgh and now is one goal shy of Dino Ciccarelli's rookie record of 14 in 1981 for Minnesota. Guentzel put the Penguins up 1-0 on their second shot with a wrister off a rebound of Ian Cole that beat Rinne just 2:46 into the game. Rinne stopped the next 26 shots for the victory and the party continued into the night. Early on, Matt Murray extended his scoreless streak to 72:54 with the Pittsburgh goalie looking ready to notch his 21st playoff win. Then he gave up five goals in the span of 15 shots and the catfish watch was on. The Predators got it started with a three-goal flurry in the second. Josi scored his sixth goal off a slap shot at 5:51 , tying it at 1-1 and finally giving nervous fans something to enjoy. Then Gaudreau, who scored his first career NHL goal in Game 1, scored 42 seconds later to put Nashville ahead with his wrister from the high slot, taking advantage of a screen by Penguins defenceman Ian Cole to beat Murray glove-side. Just after that go-ahead goal, the Penguins had a rush on Rinne, and the three-time Vezina Trophy finalist made back-to-back big saves. First, he stopped Phil Kessel's wrister from the right circle. The rebound bounced back into the slot, and Rinne made a save on Chris Kunitz with an assist from Subban sliding over to help. Neal made it 3-1 with 22.6 seconds left in the second, banking the puck off Murray's left arm for his first goal in the series and sixth of the playoffs. Smith's goal on a breakaway at 4:54 was his first of the playoffs, and Ekholm padded the lead with a power-play goal with 6:50 left. "We played some good hockey in those first two games, just a couple little breakdowns and they jumped all over us and it was in the back of the net," Neal said. "It was a good job of limiting that tonight." As for Rinne, Neal added: "We felt we left him out to dry a few times in the last game. I thought we did a better job tonight."